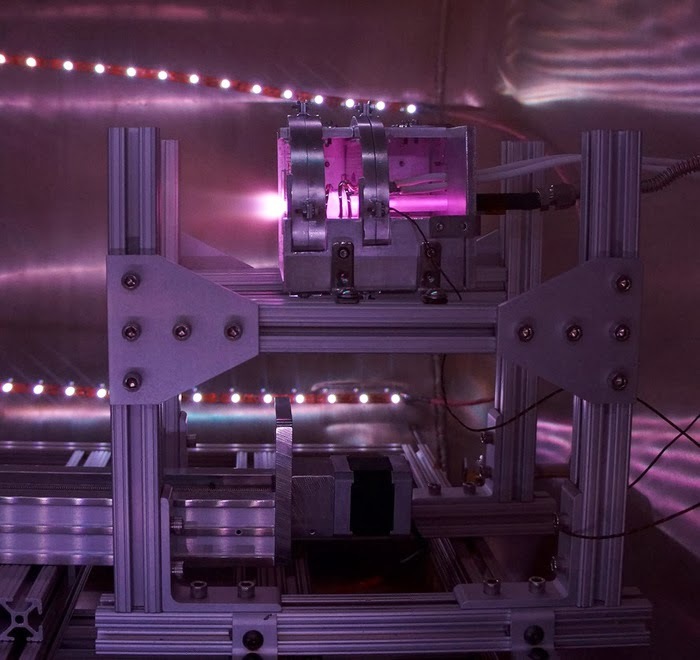 The CAT Thruster being developed for cubesats to give them a method of propulsion instead of simply falling out of orbit after a given period of time is one I wrote about quite a bit during the campaign's first and then second iteration on Kickstarter. Luckily the second time a more reasonable funding goal of $50,000 was set instead of the original $200,000 which was not reached, and the campaign was able to rake in $96,799, of which $10 was mine. The decision to donate was an easy one as it was to a team that was already carrying out such experiments at the University of Michigan's Plasmadynamics and Electric Propulsion Laboratory, and a Kickstarter campaign would simply allow them to do more of what they needed to do today, instead of (or rather, on top of) applying for funding and waiting for the months or years it takes for approval. So what have they been doing since December 20 when the campaign ended? Here's what they're doing. As they told me in response to a question last year this would make missions to targets like the massive water-covered 24 Themis a possibility, so it is truly exciting.